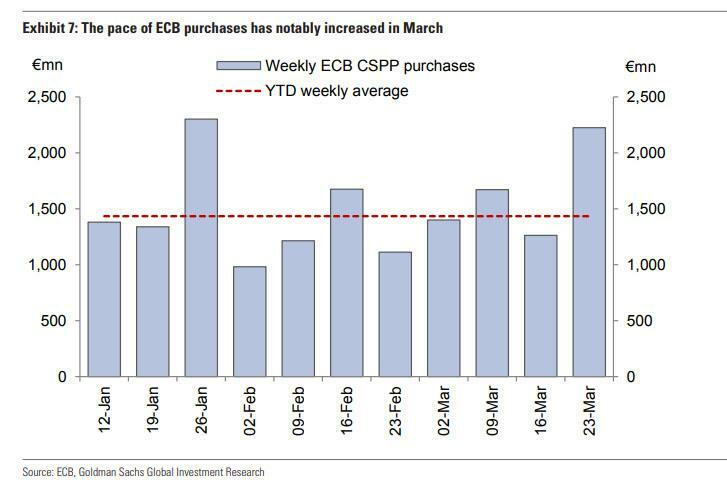 ... we showed that in order to avoid a sharp drop in Europe's corporate bond market, the ECB doubled down on its active intervention in the corporate bond market, and in the week ended March 23, the ECB purchased a whopping 55% more in IG bonds than its YTD weekly average. The problem is that in order to avoid a March rout, the ECB may have soaked up much of the remaining marketable bonds, and as Deutsche Bank observes, there has been an abrupt slowdown in the ECB's purchases under the CSPP program so far in April, which has prompted the German bank to ask if the ECB has started a stealth CSPP taper at a time when it is also actively tapering its government sector bond purchases. To be sure, the ECB won't be the first central bank to engage in a stealthy taper, one which is visible to the market but hasn't been officially disclosed due to concerns of explicit messaging, and is a function of the decline in private securities that the central bank can purchase at any price. As we have discussed over the past year, the BOJ has famously been doing just that since the start of 2017, and just last week, the Nikkei reported that the BOJ's purchases of JGBs have slowed to a pace not seen since the central bank launched its massive monetary easing program, a development that has not escaped the notice of market watchers. So what about the ECB? Well, as we discussed one month ago, CSPP buying in Q1 was very solid. However, the CSPP pacefell sharply in absolute terms over the last four weeks as shown in the chart below. In fact, last week's net volumes in particular were significantly lower than in any week since the CSPP began apart from the typical late-December QE hiatus. 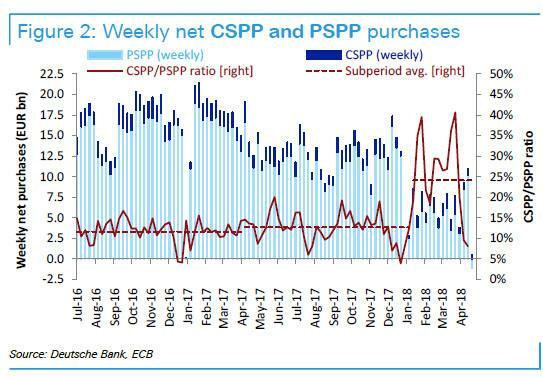 This sharp slowdown prompted Deutsche Bank's Michal Jezek to ask if this is a signal that a new CSPP regime has started in Q2, three months earlier than we expected? 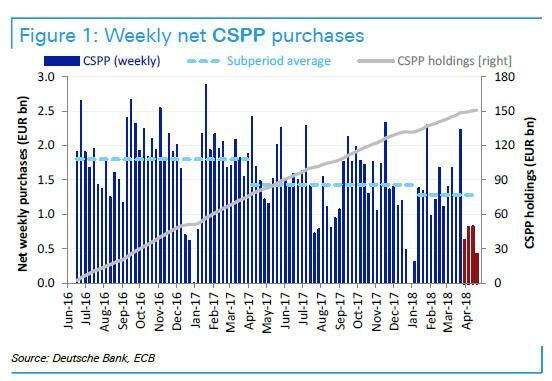 Contrary to our expectations of steady buying throughout H1, the ECB may well have decided to slow down corporate purchases in Q2 already in order to wean the market off the addictive effects of the CSPP. Mario Draghi may be asked about this at the ECB press conference on Thursday but he is, in our view, unlikely to give up flexibility/optionality by confirming any potential regime change. Nevertheless, if the weekly CSPP data release next Monday confirms this pattern, it will be hard to doubt that it is indeed what has happened. The sharp regime change is even more obvious in the following chart, which shows that after a sizable jump up in the net CSPP/PSPP ratio in Q1, it plummeted in April. While it may appear even worse than the historically small but positive net CSPP purchases (€0.4bn), a closer look reveals that in flow terms the CSPP has slowed down more. In particular, April is a month with the lowest CSPP redemptions (€87mn) but highest PSPP redemptions (€22.7bn) between January 2018 and March 2019 (the latter is the farthest we have data for). The massive redemptions drove net PSPP purchases below zero only last week because mere €3.1bn of PSPP bonds matured in the first half of April and the remaining €19.6bn are due in the second half of the month. Obviously, less (eligible and total) issuance than in March might be another reason for the CSPP slowdown but that would not explain why so much less has been bought than in February with a similarly quiet primary market. Finally, DB proposes that it is possible that the ECB feels less need to buy corporate bonds when credit rallies as has been the case in April (Fig. 6) In fact, despite low CSPP flows eligibles have outperformed ineligibles. (Fig. 8) While there is no definitive answer - so far - it is possible to point to many periods in the past when spreads were rallying and it did not deter the ECB from heavy buying, the most recent example being January (Fig. 3 vs. Fig. 5 & 6). In summary, Jezek thinks that CSPP purchases have historically tended to be relatively price insensitive and do not attribute the recent slowdown to pricing considerations. While we may conclude that some form of CSPP taper is likely given four weeks of significantly lower purchases, two of which were outside any Easter break seasonality, we still need more observations to have greater confidence in that hypothesis or refute it. But as we stated at the start, if the weekly CSPP data release next Monday confirms this pattern, it will be hard to doubt. The strategist leaves on an interesting question: whatever the reason behind it, "less corporate buying did not seem to undercut the recent rally. Could credit be blasé when the CSPP flows die down for good?" Perhaps, or maybe the market simply failed to notice until now. A better test will be what happens if there is another blow out in European IG (and HY) spreads, and whether this will push the ECB's bond buying into overdrive. If so, that would explain why the market has so far failed to respond to the ECB's stealth taper: it realizes that the moment any credible selloff emerges, the ECB will be right there, backstopping everyone. Until, of course, it can't, because the simple reason why it is forced to taper purchases is that it will soon run out of both eligible bonds to purchase, and willing sellers, who may not be willing to part with the paper at any price, no matter how much the price-indiscriminate ECB offers. Finally, as Bloomberg's Tasos Vossos writes, the question of bond scarcity is bound to come up again at tomorrow's ECB meeting. That should put increasing focus on the timing of the central bank's exit from its asset-purchase program, even as investors are unlikely to get details until at least July... even if the central bank does want to stay active, it may have a problem finding notes to buy after almost two years of purchases and a slowdown in issuance. Euro IG credit spreads have tightened this month, amid slower ECB buying, suggesting that investors are unwilling to offload holdings. Meanwhile, the ECB already faces a similar if far more acute problem finding government bonds for its public sector purchasing program, pushing it toward paper from "sticky hands," like insurers and pension funds. And the longer the ECB fails to stoke the inflation it needs to "inflate" away the debt, the greater the risk the ECB will run out of eligible private and public sector bonds, which ultimately will mean that Draghi first, and soon every other central bank will be "forced" to start monetizing stocks, which will be the necessary (and sufficient) condition to launch the endgame.